It's done! Firefox 1.1 for Maemo devices (Nokia N900, N810) is out in the wild, and it's packed with awesome. Over the last several weeks of the beta, members of the mobile team have written blog posts about most of the new features and improvements you'll find in the browser. Here, with quick summaries, are links to all of them - enjoy! When you tap on the Site Button in Firefox 1.1 for Maemo, you'll see more than just the site identity information you're used to from previous versions and Firefox on the desktop. You'll now also get a number of actions that will help you manage your relationship with the site you're currently on. Certain of these actions, like "Save As PDF" will always be there, because they're always relevant. Some others will only be there when there's need: "Add Search Engine" will only show up if the site offers a search engine that you can add to Firefox's search bar. "Forget Password" and "Clear Site Preferences" will be there only if you've previously told Firefox to save your password or to always behave in a certain way (always block pop-ups, for example). When you hold your mobile device in portrait, Firefox will automatically rotate and resize itself to fit. A number of designed-for-mobile sites prefer this orientation, and now they'll display as intended in Firefox. When you launch Firefox on your mobile, it now provides a couple of things that are often of particular interest at the beginning of a browsing session. First, the new Start Page presents you with a tappable list of of all the tabs you had open the last time you were using the browser, and also gives you a way to open all them (useful if you have a set of pages you always like to keep open). Second, if you have Firefox Sync installed, it gives you a quick link to the list of tabs you have or just had open on your desktop computer. Finally, it uses the opportunity to mention one or two recommended add-ons. you want to have a permanent record of a receipt or a confirmation page after booking something online? When you find yourself in either situation, you can now tap on the Site Button and select "Save As PDF." Read more about "Save As PDF"
Firefox now provides finger-friendly "tap-and-hold" contextual menus. When you want to open a link in a new tab or save an image, you can tap and hold your finger on a link or image, respectively, to get the actions you need. Smart Tap is what we're calling the system in mobile Firefox 1.1 that makes it easier for you to tap on small links, fields, and buttons. One of the most requested features after we released Firefox on Maemo 1.0 was for a way to "free-form" zoom. Firefox 1.0 already lets you double-tap to zoom to a column of text or an image, but sometimes that's not enough. 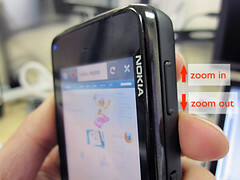 Now, on the Nokia N900, you can use device's rocker button to zoom freely in and out. Future versions of Firefox on devices with multitouch will support pinch-zooming. Firefox 1.1 does even more than before to help you avoid having to type: it now does form field autocompletion. Using an algorithm similar to the one that powers the awesome bar, Firefox will suggest entries appropriate for the form-field you're on based on what you've entered before. For forms you use a lot — checking into a flight, entering your address — a single tap can replace a lot of messing around with a keyboard. The best part is that with Firefox Sync, your form entries from your desktop computer will automatically be on your mobile as well. Firefox 1.1 for Maemo has improved support for the <meta name="viewport"> tag. Previous version of Firefox on mobile devices supported the width, height, and initial-scale viewport properties, but had problems with some sites designed for iPhone and Android browsers. The browser now support the same properties as Safari, and Firefox now renders mobile sites more consistently on screens of different sizes and resolutions. 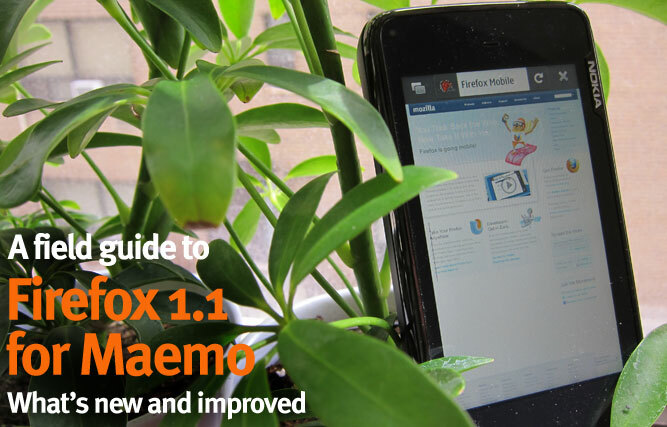 Firefox for Maemo 1.1 introduces automatic add-on updating. Once a day, Firefox will check to see if there are updates to any of your installed add-ons, and, if there are, it will install them for you. The browser will notify you of what's going on, but you won't have to restart Firefox until you're ready. Of course, if you know there's a new version of an add-on and you want it right away, you can still go to the Add-ons Manager and press the "Update" button yourself. One of the key ways that Firefox gets better is by people sending in crash reports if something goes wrong. This is made much easier and quicker for you to do now, with a Crash Reporter app that launches if Firefox crashes. If you decide to send a crash report to Mozilla, and we really hope you do, you can see your crash, and other crashes, at the Mozilla Crash Reports web site.